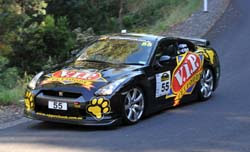 Tony Quinn in the VIP Petfoods R35 GT-R over came their Friday deficit to Jim Richards in the 911 GT2 to pull a narrow lead after Saturdays stages. The two drivers are trading back and forth quick times though stages. Sunday is the last day of the event, lets see who will be on top. Two veterans of Australian motorsport, Jim Richards and Tony Quinn, have had an enthralling dual on the second day of Rally Tasmania, with just 1.9 seconds separating the pair after 144 testing competitive kilometres. The narrow margin ensures a titanic struggle on the final day between the Porsche 911 GT2 of Richards and the powerful Nissan GTR of Quinn across the last 72.33 kilometres around Sheffield in the state’s north. The two have cleared out on the rest of the field. Local Burnie driver, Jamie Vandenberg is in third place, 56.5 seconds off the pace in his Mitsubishi Lancer Evo 9, while Tony Longhurst is another 11.9 seconds back in his Les Walkden Rallying-prepared Subaru Impreza WRX STI. Rally events have picked up in popularity over the last few years. With better coverage, and some prominent names, it seems like a fun thing to do.